Jan 20 Were we ever really a 'United Kingdom'? There's hardly been a time in recent memory where that name has felt more ironic. We've had Scotland just about decide to remain a part of the UK in the Scottish Referendum vote in 2014. After this, the Tory-Lib Dem government agreed to have a referendum on the EU if they won. Cameron won outright, and the Brexit referendum was set. This brought to light the deep divisions in the Tory Party, the Labour Party, and the country as a whole. As the years went on, the divisions widened, deepened, and the standard of debate sunk to increased depths. We then narrowly voted to leave the EU, in part, due to a ridiculous (though hopeful) promise on the side of a red bus. And just last week, we’ve seen an exit deal two years in the making rejected, followed by a failed vote of no confidence in the Prime Minister. The Brexit date of March 29 continues to loom as a time where who-knows-what-will-happen. Watching the politicians debate recently sometimes feels like we’re watching a squabbling bunch of children, desperately trying to grasp the steering wheel of a car that's headed towards a cliff, pulling off the incredible feat of keeping the vehicle headed in a perfectly straight line towards Armageddon. When our nation is this divided, I'm not sure what it means to be British. One answer might be love of Queen and Country, but another be a grim acceptance at the abysmally low standard of political debate in a country that’s fractured along all sorts of thought lines. What, if anything, do we stand for? Did we ever stand for anything? Even though politics in the US seems even more divided to the point of despair (I wish it would stop feeling like a competition, but at least our government is technically functioning) I'm still envious of Americans. No matter how bad things get - even if the President himself is smugly serving McDonalds on silver White-House platters - every American has a strong sense of what it means to be an American. In Britain, we don’t have that. Being a part of the US means something - or at least, Americans believe that it should. There’s a belief in a greater narrative, a sense of broader belonging. If it’s one thing that the US proves, it’s that you can have two sets of non-contradictory identities. I’m sure anyone from California, Florida, Colorado or Texas could all list of dozens of things that separate them from their state counterparts. But they would all unfailingly call themselves American. All United. In Britain, we could - in principle - have this feeling of shared identity too, but we don’t. In the UK, there’s no sense of what it really means to be a part of the whole. Instead, most people here have a strong idea of what it means to be English, Scottish, Welsh or Northern Irish. For many, this identity is felt down to their bones, rooted in hundreds of years of fraught history. These countries each have their own rich cultures, histories, traditions, cuisine, dialects and languages. In an ideal world, these differences would be celebrated with a sense of unity in the UK, but it’s clear to see that the memories people have of conflict are long, and the history of the UK is full of it. A brief history of our united-ness, or consistent lack thereof. Attribution at the end of the article. 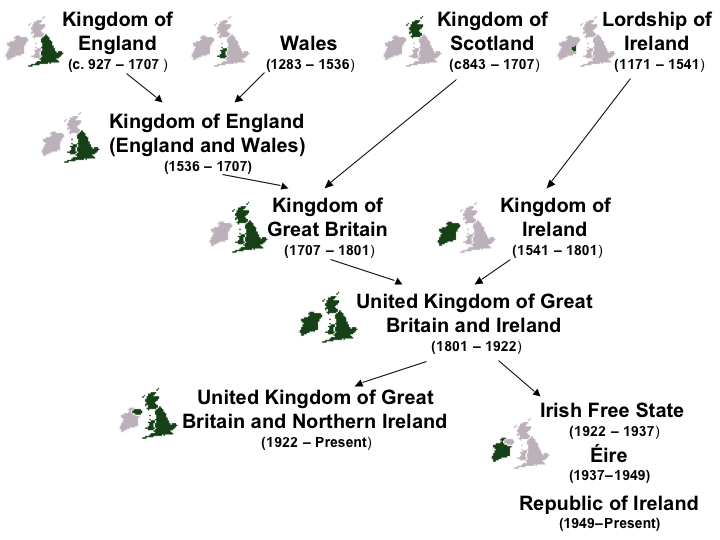 Given all this, it perhaps makes sense that it’s been difficult to establish some agreed upon UK narrative of what it means to be The United Kingdom of Great Britain and Northern Ireland. All the countries in this country are very different. Perhaps what we really need is a politician, or a leader, who can unite us. Someone who can really help us see that we need not repeat the narratives of our history, and who can help us see each other in a new way, beyond these differences, reminding us of the common good we all share. I’ll be honest; for the most part, I’m naive to the differences between England and the other countries in our country. This is because, to some degree, I have no real sense of what it means to be English, let alone to be a part of the UK. This means I feel no contradiction between the layers of identity I have: being a Londoner, an Englishman, a Brit, an Australian (thank-you dual nationality) a European, and a general citizen of the world. It’s only really for the first of these - being a Londoner - that I can really articulate some explicit meaning. So I cannot tell you what it means to be British. I would like it to mean something involving unity and camaraderie - not only amongst ourselves, but also with Europe. In that childish wish, I suppose I am lucky. It’s easy to feel no reason for separation when you feel no real distinction. As such, in these divided times, all I feel I can do is try to truly understand and listen. Everyone, in some way shape or form, wants the best for themselves and their people. They just differ on who their people are, and what that best is. In these uncertain times however, I am comforted by one thing that I do believe in; Something that I know will be OK. That, is London. In London, no one looks out of place. Unless you’re a tourist wearing an abominable “I <3 LDN” T-shirt, there is nothing about your appearance that could cause someone to think that you may not have grown up around the corner from them - that they have, for their entire life, lived and worked in this city. The structure of the city itself is just as varied and diverse as the inhabitants. Districts are strung together by old chaotic transport systems, built around a river that almost looks like it was conceived to be an engineering nightmare to build around. Our mayor is Muslim, our most common dish is curry, and almost every language in the world is spoken here somewhere. And it is a tough city. London has survived plagues, terrorist attacks, the blitz, being burned down entirely, and continues to trundle along despite its newest potent ailment - the frequent rail strikes. It survives consistent clogged and clotted arteries - the traffic jams on the M25 road that surrounds the entire city, the ever persistent roadworks that struggle to keep a city functioning that was never designed or built for cars - forever repairing things temporarily until the next pothole appears. It exists for days or weeks on end without sunlight or shadows - the sky often being an endless sea of overcast grey, rendering everything in a strangely perfectly lit way. It is bigger on the inside, and consistently regenerates slightly differently, reminiscent of a tardis and time lord. It is the ultimate hack-job, Theseus’ ship of a city. I believe that, despite all of this, London does have a collective sense of identity; that of being a ‘Londoner’. It comes not from a single common language, sport, dish, or history of the people here. It is a thing that is rarely ever spoken. Its origin is more nuanced. If you get up early enough on a Friday morning to watch people going to work after Thursday evening drinks you might catch it in their faces. You might have seen it in the grace and calm that the people of London carried themselves with as they returned to work the day after the London bombings. You’ll hear it in the grunt of commuters packed into an overly crowded tube, or the look of mild and temporary dismay as someone stops to look and really see how unappealing the Thames waters are. What unites us is a resilience. A grim determination to get on with things. I imagine it’s not the only city to have this - I’m sure people in NYC or Hong Kong are just as busy and determined, if not more so. But London, in most places, and for most of us, lacks glamour. It just persists. And people persist with it. To be a Londoner, to me anyway, just means you get on with things - and let other people get on with theirs. Tough, tolerant co-operation. It’s a quiet, pervading mantra. Next time you’re in the city, listen out for it.